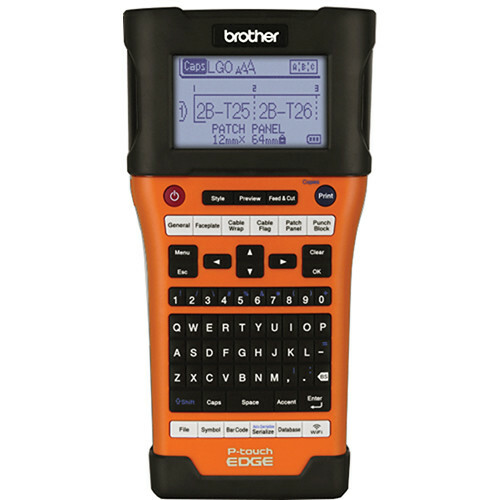 Design and print labels from a computer or link to a database wirelessly to save time with the PT-E550W Industrial Wireless Handheld Labeling Tool from Brother. Featuring both USB and Wi-Fi connectivity, as well as standalone modes by downloading templates and databases, the PT-E550W is a versatile and portable unit. It offers a print resolution of 180 x 360 dpi along with the ability to accept tapes from 0.14 to 0.94" wide by up to 26.2' long. Additionally, it has a QWERTY keyboard with rubber keys as well as an automatic cutter for speed and accuracy. Further benefitting the devices mobile nature is the rechargeable Li-ion battery for complete wireless operation. Also, it comes with P-touch Editor v5.1 Label Design software for more control over your designs. A backlit LCD screen is available for checking labels before printing. Box Dimensions (LxWxH) 15.3 x 13.2 x 5.2"
PT-E550W Industrial Wireless Handheld Labeling Tool is rated 4.7 out of 5 by 7. Rated 5 out of 5 by Greesha from Top of the Line I was shown the PT-E550W at a cabling industry convention and decided to give it a try. Of all the cable labeling tools that I have worked with during the past 20 years, the PT-E550W is the best. The labeler itself is easy to use. I can make any conceivable communications related label ahead of time for planned projects or on the spot for short order work. The printed labels are also very professional looking and the use of commonly accessible P Touch TZ tapes is a real plus (no over priced- factory order label tapes needed here). Whomever designed this one did a great job! Rated 4 out of 5 by RACASKEY from Very nice Label Printer. Solid and versatile label printer. It will use an incredible array of label formats. The Windows software is fine but the Mac software is weak. It has difficulty with spreadsheets, etc. on a Mac. Rated 5 out of 5 by BobRRS from Compact and perfect labels Works fantastic. Like it can go from shrink cable to label and it is portable. Love the cable shrink. Not the machines fault – but would be nice to have cable shrink that would work on cables that have connectors at both ends. Again – great product! Rated 5 out of 5 by ACEMAN from A great improvement from the label printers I had I had 2 different models of a competitors printers and this has out preformed in one day! I love the apps for the phone and computer. I also love the clear printing that this unit preforms. It makes me want to label everything. Rated 4 out of 5 by WorkAccount from Good Printer Purchased this after seeing a consultant using this. Works well for our need. Really like that some of the label media has a clear layer that protects the print and keeps it clean and free from smearing.